I have been a virtualization guy for a long time, so when Microsoft released Hyper-V 2.0 with Windows Server 2008 R2 I was among the first to ask why they weren’t including it in the client OS. In my opinion it was a no-brainer. With the launch of Windows 8 with the client-side Hyper-V, they made a Layer 1 hypervisor available to the masses. True, there have been free Layer 1 hypervisors for years (Hyper-V Server, ESXi and others), but they required another machine to manage them, and those machines had to be properly networked. There are people out there who do not have multiple systems to play with. When it comes to doing demos outside of your office environment not only would you need two systems, but they would both have to be portable. For most of us, this was unmanageable. Of course, Windows 7 did have Virtual PC, and even Windows XP Mode. These were great solutions for what they were, but Virtual PC never supported 64-bit guests, which meant that in order to run a x64 OS (such as Windows Server 2008 R2) you needed a third-party virtualization platform. It also meant that, as an MCT, if you wanted to run the Microsoft Official Curriculum courses on your system you needed to be running Windows Server 2008 as the base OS. Alas, in Windows 8, Windows XP Mode is no more; however that doesn’t mean that if you need to run Windows XP you cannot simply build a Hyper-V machine running that OS. Same is true for Windows 7, which I run in a VM for two distinct reasons: so that I can answer questions for the vast majority of people who are still running that platform, and because Windows 8 no longer supports desktop gadgets. (If this second reason sounds a bit peculiar, then you should know my secret: I use the Windows XP End of Support countdown gadget to keep you all informed as to the number of days left until #EndOfDaysXP ). In my professional capacity I have needed Hyper-V on my laptop for several years; I have used one of three methods of achieving this need: Dual Boot, Boot from VHD, and occasionally Native Boot. All of this because I also needed the Windows client on my laptop. Now, however, I can run my virtual machines (32-bit or 64-bit) from Hyper-V in Windows 8, and I don’t have to decide how I am going to boot my laptop each time I start up. In addition to installing Hyper-V in the Native Boot Windows 8, you can also install it in a Boot from VHD environment, as well as on a Windows To Go (WTG) key. However on those you should be even more aware of where you are storing your VMs, because storage space will be more scarce. In addition to the native hypervisor, you might also want to install the Hyper-V Management Tools (either GUI or PowerShell, or both) on your client. By doing this you can now manage remote Hyper-V servers from your desktop (in the same way that you could do in Windows 7 by installing the Remote Server Administration Toolkit). To install these features, simply open the Windows Features screen, and select the desired features (Hyper-V Platform, Hyper-V Management Tools). From the Windows 8 Start Screen type Features. Ensure that Search is in the Settings context. The Windows Features window will appear (pictures at left). scroll to the Hyper-V context. 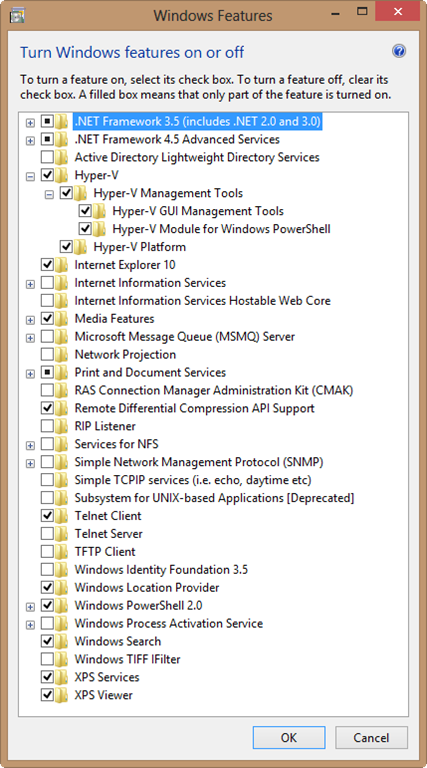 Expand Hyper-V, and select the desired features. Just as is needed in Server, Windows will install Hyper-V, and then will need to reboot twice (See the article Layer 1 or Layer 2 Hypervisor? A common misconception and a brief explanation of the Parent Partition). Once the reboots are complete, you will be able to create and start virtual machines, just as you would in Windows Server. You can import and export them, pause, save, and snapshot them… just like you would in Windows Server! Now it is important to remember that the same hardware requirements for Hyper-V apply to the client. Your CPU needs to support hardware virtualization, and it must be enabled in the BIOS. For that reason I don’t expect that MacBook users will be taking advantage of this option. You also need to have Second Level Address Translation (SLAT). However if you bought your PC within the last five or six years (and it doesn’t have an ATOM processor) then I expect you will be fine. By the way, while I was writing this article I was made aware of a similar one in Windows IT Pro Magazine. Check out Orin Thomas’ article on the Hyperbole, Embellishment, and Systems Administration Blog called Windows 8’s “Killer Feature” for Microsoft Certified Trainers. Good luck, and may the virtual force be with you! ← Is it true? The Memory Tax is gone! To manage Hyper-V on a Server Core installation, you can use the Hyper-V management tools to manage the server remotely. The management tools are available for Windows Server 2008 and Windows Vista Service Pack 1. For more information, see article 950050 ( http://go.microsoft.com/fwlink/?LinkId=122188 ) and article 952627 ( http://go.microsoft.com/fwlink/?LinkId=122189 ) in the Microsoft Knowledge Base.